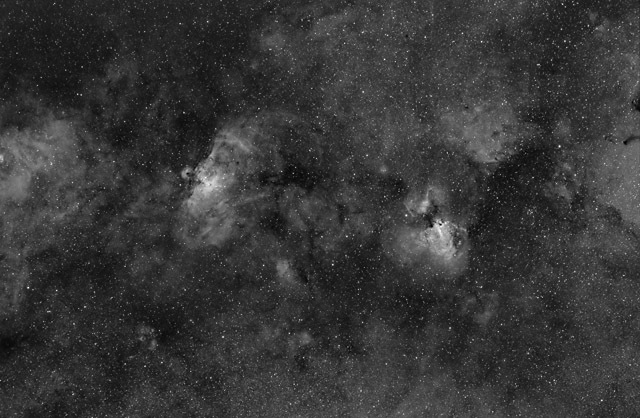 In this image, I blended 27 hours of Hydrogen Alpha data taken with a wide field 200mm lens along with detail images of M16 (8 hours) and M17 (13 3/4 hours) taken through my Celestron C8 at 1160mm. The detail images were RGB (color) images that I converted to greyscale and then layered into the H-alpha data. Software Used Images Plus 5.5 for camera control, calibration, stacking, and digital development. Photoshop CS5 used for levels and curves, high pass filter, and unsharp mask. Gradient Xterminator for gradient removal. Registar for registration and stack alignment. Carboni Tools for additional noise reduction and smoothing. Focus Magic for focus restoration. Notes The very large amount of time I put into capturing Ha data for this field of view seems to have paid off well with very low noise. As it happens, processing this image was surprisingly easy, as the stacked data looked very good with just a digital development stretch. I'm fairly pleased with how the compositing of the detailed RGB images worked, although I probably should have lowered the opacity a bit more to make it blend a little more naturally. Nonetheless, I think it adds some nice detail to the main targets, particularly showing M16's Pillars of Creation rather well. I had intended to make an HaRGB image with this data and I captured 11 hours of RGB data to do this. However, I haven't found a good method for blending the two sets of data that looks halfway decent to me (in general, I didn't like how my RGB data looks), so I decided for the time being to just settle for a very nice Ha only image.